The Interpretation and Mechanistic Significance of Activation Volumes for Organometallic Reactions (R. van Eldik, C. Hubbard). Mechanisms for Catalysis by Small Molecule Analogs of Metalloprotein Active Sites (L. Berreau). Electron Transfer Reactions within Sigma and Pi-bridged Nitrogen-centered Intervalence Radical Ions (S. Nelsen). Using Kinetic Isotope Effects to Determine the Structure of the Transition States for Sn2 Reactions (K. Westaway). Mechanism for Nucleophilic Aliphatic Substitution at Glycosides (N. Horenstein). Effect of Enzyme Enzymatic Eynamics on Catalytic Activity (S. Schwartz). 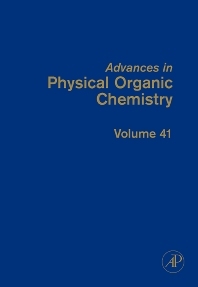 Advances in Physical Organic Chemistry provides the chemical community with authoritative and critical assessments of the many aspects of physical organic chemistry. The field is a rapidly developing one, with results and methodologies finding application from biology to solid state physics. Department of Chemistry, University of Buffalo, NY, U.S.A.